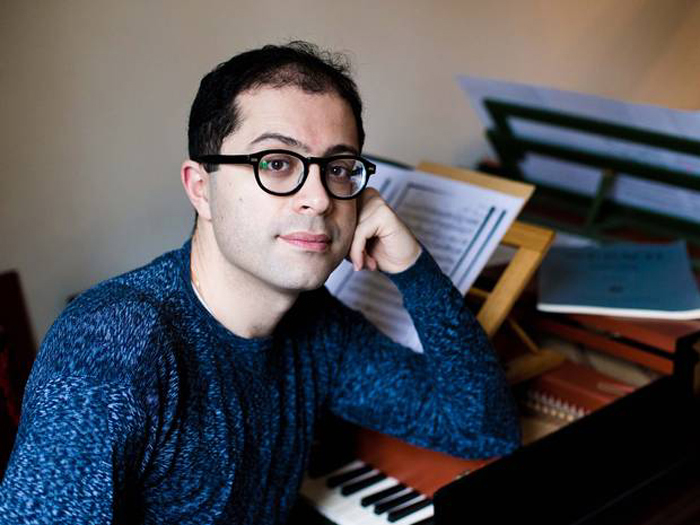 Ten years ago Mahan Esfahani was by his own account a nerdy anorak at Stanford University, obsessively tutoring himself with the aid of old records in the hope of realizing what seemed an impossible dream – to make his living on that Cinderella of keyboard instruments, the harpsichord. A few months ago, now thirty, he carried off the award for Gramophone magazine’s Baroque instrumental album of the year, and the Guildhall School has appointed him professor of harpsichord. Not bad from a standing start, and for a total outsider. But perhaps – in addition to exceptional talent, and sheer slog – that outsiderness is the key. But his parents wanted him to be a doctor, and at Stanford he started a pre-med course, only to realize after two lectures that it wasn’t for him. Law was their next idea – “as I like talking” – but he gravitated instead to the organs and harpischords of the music faculty and began to immerse himself in scores, contemporary accounts of Baroque music-making and the recordings of his heroes, with the great harpsichordist Ralph Kirkpatrick, who had been virtually self-taught, prominent among them. His next eureka moment came when he heard a recording by that sacred monster of harpsichordism, Wanda Landowska: “And I realized why the Bach I had been playing and hearing had never sounded quite right. I now know that she wasn’t particularly ‘authentic,’ but to me she got the spirit of Bach, and I think he would have nodded in approval if he’d heard her play. What I like about her is [that she doesn’t] let a set of prescribed rules for performance practice dictate what [she’ll] do with the music.” This is said with a pugilistic fire to which we will return. More ire is directed at the early-music industry. Disdaining the conventional keyboardist’s tight-arsed silence – “This isn’t a gun club, it’s music!” – he talks to his audience, illuminatingly and amusingly, between the pieces he performs: he may be a serious musicologist, but he wears his learning lightly. Get him on prevailing attitudes to his instrument, and he really takes off, becoming very exercised about critics who, while praising his recordings, add the ritual rider that his playing “transcends the harpsichord’s limitations.” “If someone comes up to me on Twitter and says they hate the harpsichord, I always offer them a free ticket, saying come and see what you think. And nobody has ever said afterwards that they didn’t like it. They say ‘I didn’t know that it could sing like that’. But of course it can, it’s an incredibly vocal instrument. Its sound is clear and precise, and has a great deal of color.” And the spurious contest between harpsichord and Steinway should emphatically not, he argues, be seen in terms of decibels. “That shirt you are wearing is not a ‘loud’ shirt, but it has a lot of colors in it, it’s loud in a different way. The harpsichord enables you to hear much more subtlety, and it has a sensual quality. If any pianist wants to slam it” – and one prominent pianist routinely does – “be ready to have a public discussion with me, and have a piano and a harpsichord ready on stage.” Any takers? And his ultimate ambition? “To record on the harpsichord every keyboard piece Bach wrote. I reckon it will take me twenty years.” That’s him sorted, then.